Speaking to modern brides, most wish for an unrestricted, casual setting for their wedding, but at the same time, wishing for the venue to be unique and one-of-a-kind. Finding a perfect combination of the two definitely is not an easy task, but Privé Group recently opened up a new venue that fits the bill. 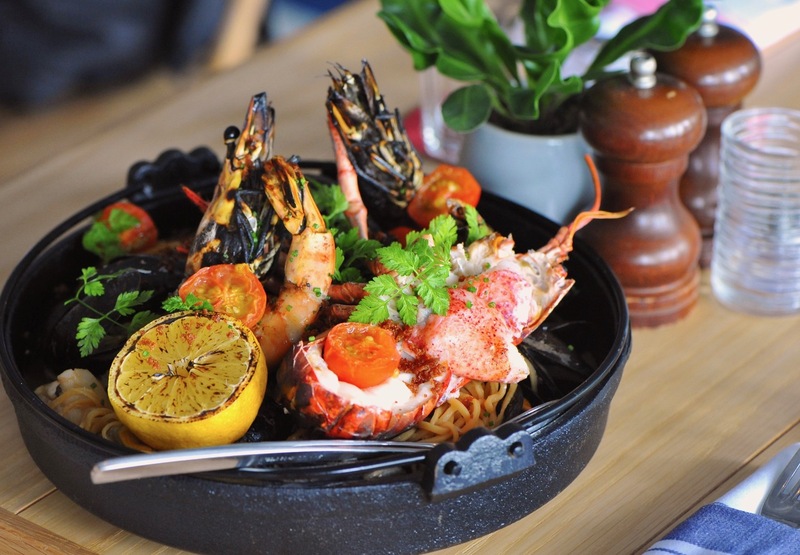 Situated on Singapore’s only private island, Keppel Island, Bayswater Kitchen is not only unique for its waterfront setting, but its casual Mediterranean vibe presents a unique nautical experience for you and your guests. With both indoor and outdoor spaces available, you can choose to hold your wedding solemnization in the breezy alfresco area right by the waters, followed by your dinner reception in the elegant yet cosy indoor area. Voted as “Best of 2017” under New Restaurant by The Straits Times, read on to find out what else is in store at Bayswater Kitchen for your big day! As city folks, our fast-paced and hectic lifestyles often let us forget that we are on a beautiful island surrounded by relaxing waters. At Bayswater Kitchen, its breathtaking waterfront views of the marina will instantly transport you out of the city and into a holiday mood. A fleet of luxury yachts and Sentosa in the distance will serve as the backdrop of your ‘I Dos’. 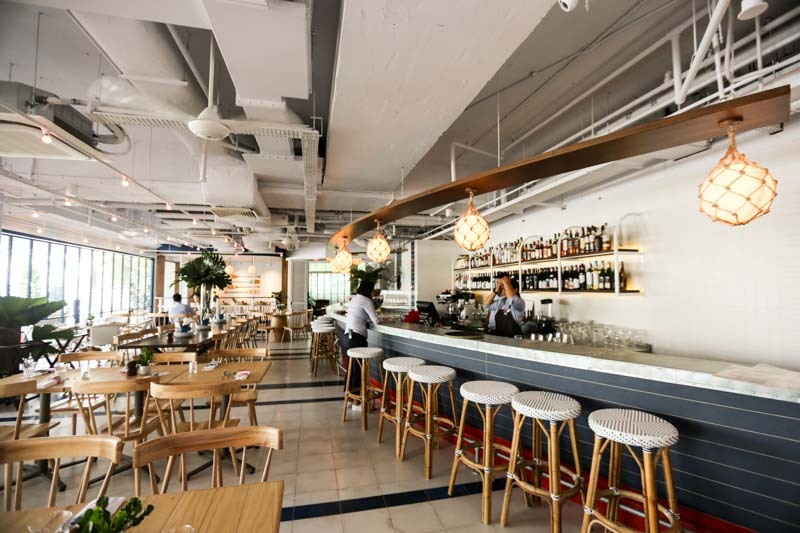 Designed by HUI designs, the restaurant’s Mediterranean-inspired decor consisting of wooden chairs, maritime-striped cushions, and a boat bar is reminiscent of island life. It gives rise to a casual, uninhibited atmosphere so that your guests can enjoy the evening without any restraint. For couples looking to move away from the conventional formal setting of a ballroom, this chic spot will refresh your guests with sunshine and fresh air. Additionally, Bayswater Kitchen seamlessly integrates outdoor and indoor spaces together, allowing your guests to experience the best of both worlds. With a setting so calm and serene, you will find it easy to let your hair down. On top of the promise of fresh air and sunlight grace, Bayswater Kitchen seemingly brings the Mediterranean right to you. Its open kitchen breathes life and buzz to your wedding as guests can see live-cooking action right before their eyes. With the kitchen helmed by chef de cuisine Jack Allibone, who has over 10 years of experience and most recently worked as sous-chef at award-winning seafood restaurant Angler in London, you can rest assured that the team will prepare mouthwatering dishes for your celebration. Bayswater Kitchen’s menu boasts fresh seasonal produce that is prepared simply yet creativity. Their objective, simple – to enhance each ingredient’s inherent freshness and flavour. Their seafood dishes present grounded yet uplifting flavours that are clean and never fail to deliver a tasteful experience. Signature must-try dishes include Tuna Tartare with Avocado, Lime Dressing and Crispy Shallot, Chargrilled Octopus with Smoked Roe, Gremolata and Borlotti Beans and last but not least, the best being their Fisherman’s Feast. This hefty dish is comprised of prawns, mussels, squids, and seasonal fish – well-cooked with seafood stock & tomato and served with hand-rolled Linguine. Check out their set lunch and ala-carte menu. At Bayswater Kitchen, it might start with seafood, but it surely does not end there. 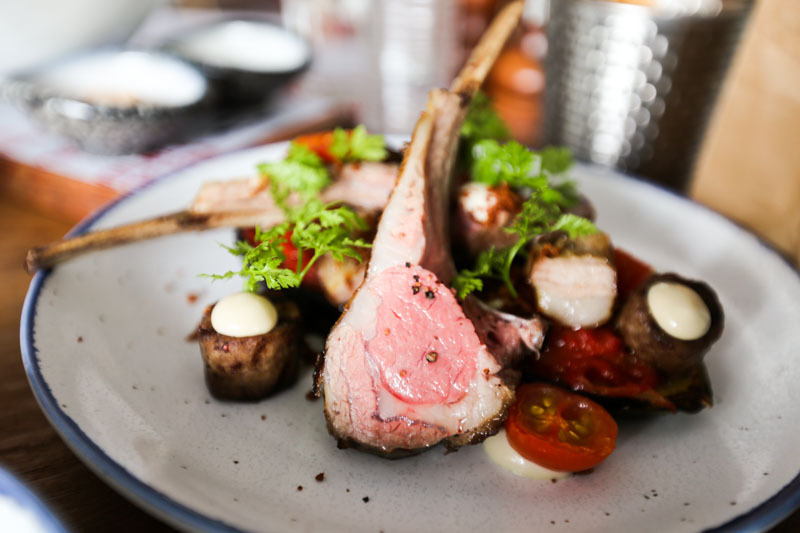 On top of their expertise in creating fresh seafood dishes, Bayswater Kitchen also caters to meat lovers and vegetarians with their juicy steaks and refreshing salads! Protein-lovers, be sure to try their flavorful Duroc pork chop, tender hormone-free chicken, and for veggie-fans, delight in their grilled radicchio orange braised fennel with cracked wheat and courgette. Bayswater Kitchen also has a bites menu that makes great canapés to kickstart your reception – the crisp calamari with lemon garlic sauce is a winner. Aside from their food menus, Bayswater Kitchen also features an extensive wine and bar menu. Their curated list of international wines includes crisp roses and sparkling wines that pair perfectly with their main courses, whether seafood or meat. Their bar menu features a range of beautifully crafted cocktails that definitely gets the party started. A must-try would be their in-house Bayswater Piña Colada. Combining the complex aroma of mount gay rum with the sweetness of pineapple juice, zest of orange juice, and the creaminess of coconut cream, lastly topped with dry rose petals and angostura bitters powder.. you just found yourself a drink that you cannot stop going back for. Whether in the day or evening, Bayswater Kitchen’s cosy and elegant setting is perfect for a celebration. Its indoor and outdoor spaces make it fun for you to seat your guests. With family members seated indoors and friends freely roaming outdoors, you get dedicated spaces for each group to have fun, but at the same time, keeping everybody together. I suggest booking the entire venue to enjoy the exclusive space all to yourselves. Best hours are during dusk where sunset takes over the skies! The full venue can accommodate up to 450 guests for a cocktail reception, 220-260 guests for a sit-down dinner, and 400 guests for a buffet, making it one of the alternative restaurant venues with a larger capacity. This gastronomic destination with its approachable seafood-centric dishes sure for a fun, casual, waterfront wedding. The restaurant also houses a multipurpose recreation room equipped with ping pong table for some fun engaging activities if you’d like. As Bayswater Kitchen also aims to make wedding planning a smooth experience for couples, their wedding package has a simple table set up that includes a table runner, bottle vases, table numbering, tea lights, consistent with the nautical seaside theme. A bridal room, stage area, projector, and screens, microphones are also available for your usage. For those who worry about guests who are driving, there are 180 sheltered parking lots for your guests ($2.50/hour). Bayswater Kitchen also has value-added services that you can add on to enhance the romantic atmosphere, such as a Deejay, customised ice sculpture, customized cocktails (great for thematic weddings), and wedding favours. They can also set up a transparent marquee with fairy lights or ivy leaves if you would like to have your solemnization outdoors! It will definitely make your celebration even more unforgettable and special. With the Mediterranean known for it’s fun and relaxing seaside vibes, Bayswater Kitchen aims to bring that beauty and experience to you. If you are in search of a unique wedding venue with good vibes and fresh seafood for your big day, it’s time to anchor your love at Bayswater Kitchen. Do check out their wedding brochure here and drop them a message here. This post was brought to you by Bayswater Kitchen. All opinions remain writer’s own. For more information, kindly refer to our copyright & disclosure policy.